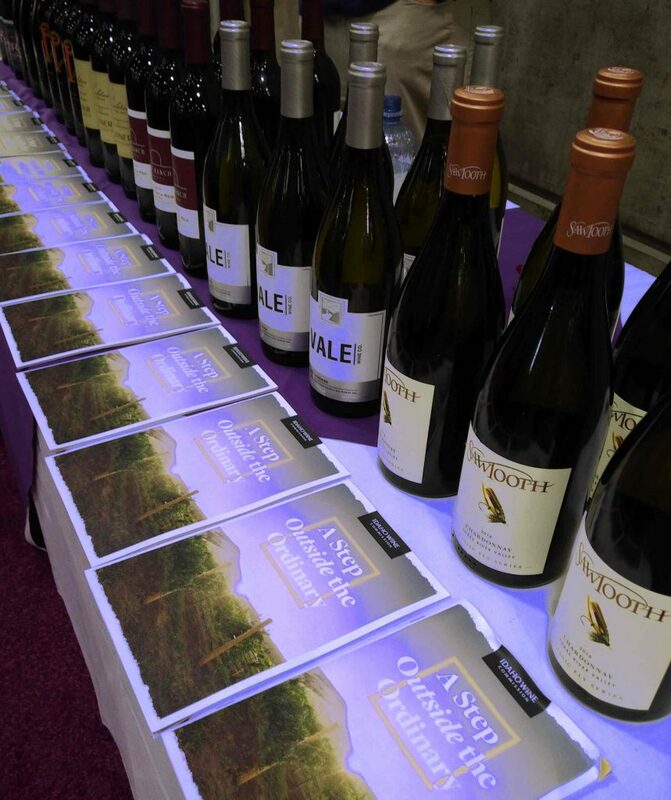 At the back of a vast exhibit hall, two winemakers manned a table lined with bottles and brochures touting the Snake River Valley and Eagle Foothills wine regions. Corkscrews at the ready, they prepared to pour for the regional tasting hour, closest thing to happy hour at the Unified Wine & Grape Symposium. Symposium personnel arrived with tubs of ice and strict instructions. Pour a bit more than a taste, but not a full glass, said the guy with the ice. He pushed a finger against a stemmed glass to demonstrate the the fill line. And don’t pour for anyone who doesn’t have an embossed souvenir glass from the Symposium. The Idaho commission was among more than a half-dozen industry support organizations with a presence at the 25th Unified Wine & Grape Symposium in Sacramento, billed as the nation’s largest wine industry trade show. Organized support for the industry takes various forms, including groups formed by wine producers themselves. Or, like the Idaho commission, they may originate in the state legislative chambers. Idaho’s Wine Commission board consists of industry members — three from the wineries and two from the vineyards — appointed by the governor. Commission staff is funded by a .45 cent excise tax per gallon for wineries and per ton for growers, according to commission administrative staff. Most of the tax is sent to the Idaho general fund, with the commission getting .02 cents from each .45. There’s also a voluntary member assessment, which most members choose to pay. “It’s optional because Idaho does not like mandatory assessments,” said the commission’s Brenna Christison. The commission is required to provide services to all members, even those who opt out of the assessment. Administrative staff are state employees, Christison told GBN. The commission promotes events and tourism. It is not allowed to lobby, but engages a “legislative educator” to shepherd statutory changes through the state capitol. The work varies from year to year, and may encompass laws affecting everything from agriculture to retail promotion, Chistison said. “A few years ago we had to do a lot with permitting, and how wineries are able to get permits in order to do (promotional) events,” she said. A relatively minor issue is on center stage in the current session. The legislature is set to adjust Idaho’s definition of dessert wine to match the federal definition. Family Winemakers of California is member-driven association “that reflects the ‘little guy’s’ point of view.” So says its website, which outlines a robust menu of support and services for the small winemaker in the nation’s largest wine state. Influencing legislation is key among its activities, according to an outline of bills tracked by the group in the last California legislative session. FWC claims a striking advocacy record. Thirteen out of 20 bills it supported were passed. Ten out of 13 bills it opposed went down to defeat. The organization is run by its members, who shape its views on “legislation, regulation, litigation and business practices.” Dues are based on .06 cents per case sold during the winery’s last fiscal year, with $300 as a minimum. FWC was present at the Unified Symposium, but did not respond to interview requests by Grape Basin News.